In the previous posts, we have covered the XI specific aspects of creating your first XI scenario. Now, let us understand what settings are required so that the R/3 partner system is able to receive and post the IDoc data. Let us start by creating the inbound function module. Depending on the result of the update, fill the IDoc status record (type BDIDOCSTAT) and append it to the corresponding table. You can download the sample ABAP code for the above function module here. 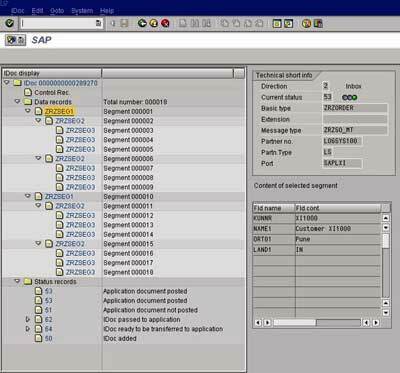 Thus using a small example, we have learned how to integrate different systems so that they can communicate with each other using SAP Exchange Infrastructure. In further posts we shall discuss more XI concepts to give you better understanding of applying your XI knowledge. Could u post a blog on ccBPMs and Performance Monitioring. I will soon be posting blog articles on ccBPM and Performance Monitoring in continuation to the XI starter KIT series. Do expect more and more XI content soon on riyaz.net Blog. If you are not interested in other non-sap articles you can choose the relevant SAP category from the right sidebar, or simply go to URL – sapnonstop.com. You can also subscribe to Email updates which will notify you by email whenever new articles are posted on riyaz.net Blog. For this you can use “Dont miss a single post – Get Updates by Email” box on the right hand side-bar on this site. Thanks! After reading gigs worth of documents on XI containing buzzwords, marketing blabber and vague abstractions these few posts have helped a great deal. Can i create ALE between Non-SAP and SAP ? Theoretically yes..I havent tried it myself…EDI can be used for communicating with non-SAP system. Your blog is so informative keep up the good work!!!! First time i am asking you one qs regarding Inbound IDOC. I am using the standard IDOC FLCUSTOMER_CREATEFROMDATA01 with message type FLCUSTOMER_CREATEFROMDATA with process code ED08.I have done every step but getting error NO_RECEIVER_CASE_ASYNC..In business sytem adapter specific Identifier i have given the logical system name but not given the r/3 system id and client as i am trying to post it in Xi server…it is taking automatically by other business service.Please help me..i am strugling from long days. NO_RECEIVER_CASE_ASYNC: This means no receiver could be found. Check your Receiver Determination. Activate and update cache. Asysnchronous messages can be manually restarted. Riyaz, really nice website to refer to all XI/PI related scenarios. Keep up the good work ! Pls add contents for BPM, XI-MDM intergration , XI-SNC Integration. We are facing problems while receiving IDOC from XI to SAP as we not sure about XI ALE settings. The IDOC itself is not getting triggered. 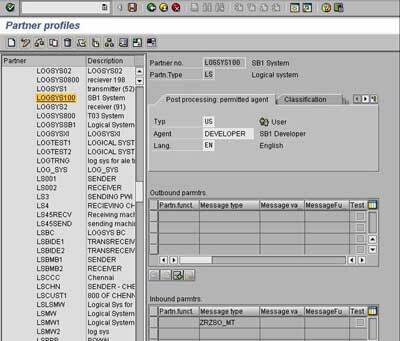 In XI system, you need to create an RFC destination (SM59) and a port (IDX1) pointing to the target SAP system. In the target system, create a logical system for XI system (BD54) and create partner profile for the logical system (WE20). IN WE20, add your IDoc type under inbound parameters and configure as described in the above article. You might alos need to add adapter-specific identifier (Logical System name) in the Integration Directory. I have read your article and it’s very easy article to start lthe XI. I have a doubt regarding class proxies. Can you explain me step by step procedure to derive the the class proxies(with coding) using ABAP? What will be the different steps? Thanks in advance. I require one info urgent. I am integrating my SAP AFS System to POS system via XI/PI. Now Does it necessary to put MATMAS as a inbound parameter in PI Partner’s profile? what i found that MATMAS message type even not existing in PI system ie EDMSG table. Hi RJ, You need to define inbound partner profile in the target SAP system and not in PI. I am a beginner in PI. I read your article it is very informative. From where may i get the materials? Our development server is refreshed with production server. After refreshed the client from 160 t0 300 in the development server and we are unable to import idoc in the development server at xi end. Please suggested us and what kind of activites we need to check. Thanks for the article which you have given on I docs,which is simpler way to understand by functional guys. For purchse orders there is process code for change,in the same way is there any process code for sales order change, or is there any use exit to achieve this requirement, i find in standerd functionality but i did not get. This article is really good and helping me a lot.